Seattle Opera Blog: Seattle Opera Announces Free Simulcast of Madama Butterfly! Seattle Opera Announces Free Simulcast of Madama Butterfly! Seattle Opera opens its production of Madama Butterfly next month on May 5, and that day will mark a huge occasion in our company history: our first-ever HD simulcast! While the drama of Madama Butterfly plays out at McCaw Hall that evening, an additional 8,000 people can enjoy Puccini's masterpiece for FREE, just steps away at KeyArena, where everything from the orchestra warming up in the pit to the final curtain call will be shown on 50 x 80-foot screen. The public may reserve priority seating for the Madama Butterfly simulcast beginning a week from today—Monday, April 9, at 9 a.m.—by visiting http://seattleopera.org/keysimulcast. Priority seating on May 5 begins at KeyArena at 6 p.m., with the performance beginning at 7:30. Madama Butterfly is 2 hours and 45 minutes long, including one 30-minute intermission. We're really excited about this event, which has the potential to bring together the largest opera audience in Seattle history. And we think Madama Butterfly—a tragic love story about a Japanese geisha and a U.S. Naval officer—is the perfect choice for our first simulcast. It's one of the world's most beloved operas, with gorgeous music that many people will recognize, even if they've never seen a Butterfly production before. Help us share the beauty and magic of opera by inviting your friends and family about this event, and by joining the conversation here on our blog, on our Facebook page, and on Twitter by using hashtag #OperaAtKey. For more information on our production of Madama Butterfly, which stars soprano Patricia Racette on opening night, visit http://www.seattleopera.org/butterfly. For more details on our free simulcast at KeyArena, visit http://seattleopera.org/keysimulcast. 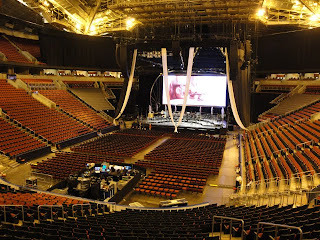 KeyArena as set up for a screened concert. Press who are interested in attending the simulcast of Madama Butterfly at KeyArena should contact Tamara Vallejos (tamara.vallejos@seattleopera.org) for more information. A PDF of our simulcast press release is available online here. We’re also looking for Seattle’s tech-savvy social butterflies—those who know their hashtags from their pinboards—to join us for a VIP Madama Butterfly experience. Those on our Social Press guest list can watch Puccini's masterpiece in style from Seattle Opera's "Tweet Suite" at KeyArena, where they'll get to enjoy free food, drinks, and a special gift bag. Plus, our Social Press will have an opportunity for exclusive perks leading up to May 5, like a backstage tour of McCaw Hall and a visit to our Costume Shop. Click here for more information, and fill out the form to be considered for an invitation. Space is very limited. This sounds great! But you should expand this service throughout the Northwest. I live in the Tri-Cities and would love to see it locally. Thanks for your comment, Zillagirl! We, too, would love to expand and bring more opera to more of the state. Perhaps you were able to get to Walla Walla when our Young Artists performed WERTHER there last fall?